Sweden and Denmark progressed to the quarter-finals after Mattias Jonson hooked in a late equaliser for the Swedes to send Italy out of Euro 2004. 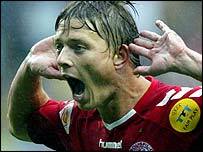 Jon Dahl Tomasson fired Denmark into a first-half lead with a brilliant dipping volley from 20 yards out. Henrik Larsson scored from the spot after the break to equalise for Sweden, but Tomasson restored Denmark's lead with a drilled shot inside the area. 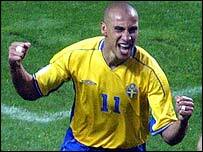 Jonson then scored at the death to send Sweden through to the last eight. Denmark will now face the Czech Republic in Sunday's quarter-final, while Sweden will face the runners-up of Group D - Holland, Germany or Latvia - but without the help of defender Erik Edman who is unavailable after picking up a second yellow card. In the build-up to the game, both sides had strenuously denied suggestions that they would play for a draw to eliminate Italy from the tournament. Italy are out because they have an inferior record to Sweden and Denmark. What's all the fuss about? And it was clear early on that no Scandanavian pact had been signed as Sweden and Denmark sought to attack. The slippery conditions in Porto made it difficult for both sets of players, but Denmark dealt with the situation far better and dominated possession in the opening period. The Danes carried the greater threat, with Thomas Gravesen working overtime in midfield, while Tomasson, Ebbe Sand and Jesper Gronkjaer foraged tirelessly in attack. The first real opportunity fell to Gronkjaer when a slip by Andreas Jakobsson allowed Tomasson's pass to reach the Chelsea winger, but he fired into the side-netting. Sweden, who had looked so compact in their opening two games, looked disjointed with Larsson and Zlatan Ibrahimovic barely involved in the game. It was no surprise therefore when Denmark took the lead, but the finish was completely unexpected. Gravesen won possession back for Denmark before finding Sand, who flicked the ball into the path of Tomasson. The AC Milan striker spotted that Andreas Isaksson had come off his line and, after controlling the ball with his chest, struck a brilliant dipping volley into the top left-hand corner of the Sweden goal. The goal was no less than Denmark deserved for their endeavour but the goal stung Sweden into action. Goalkeeper Thomas Sorensen, in outstanding form for Denmark, made a brilliant double save to first deny Larsson and then Ibrahimovic as Sweden poured on the pressure. Sorensen was beaten by Olof Mellberg's header on the stroke of half-time, but the ball bounced off the post and out of harm's way. However, Sorensen was not so lucky immediately after the interval when referee Markus Merk deemed he had brought down the onrushing Larsson in the area. The decision was harsh, especially since television replays showed that Sorensen had not made contact with Larsson, who converted the penalty kick with aplomb. The equaliser galvanised the Swedes, but Denmark refused to let their misfortune dampen their spirits and soon restored their lead when Tomasson grabbed his second of the evening. Substitute Kasper Bogelund struck a Denmark corner into a sea of Swedish bodies and the ball rebounded into the path of the lurking Tomasson, who drilled his shot low to the right of Isaksson. Yet Sweden rallied and made sure of their place in the quarter-finals as Group C winners with a late equaliser. Sorensen failed to hold Christian Wilhelmsson's cross and Jonson poked the ball home after a goalmouth scramble to send Sweden's fans into raptures. Denmark: Sorensen, Henriksen, Laursen, Niclas Jensen (Bogelund 45), Helveg, Daniel Jensen (Poulsen 66), Gravesen, Gronkjaer, Tomasson, Jorgensen (Rommedahl 57), Sand. Subs Not Used: Skov-Jensen, Andersen, Kahlenberg, Kroldrup, Claus Jensen, Priske, Perez, Madsen, Lovenkrands. Sweden: Isaksson, Mellberg, Jakobsson, Edman, Nilsson, Ljungberg, Kallstrom (Wilhelmsson 72), Andersson (Allback 81), Jonson, Ibrahimovic, Larsson. Subs Not Used: Hedman, Kihlstedt, Lucic, Mjallby, Svensson, Hansson, Ostlund, Farnerud, Wahlstedt. Sweden are only the third team to become group winners having collected only five points, following Belgium in 1980 and Spain in 1984. This 2-2 draw is the first ever stalemate between Denmark and Sweden at a major championship. Jon Dahl Tomasson increased his goal total to 31 by scoring twice in this game. He is only the sixth Dane to score at least 30 goals in internationals. Sweden's Henrik Larsson converted the 50th penalty awarded in the competition. It also marked the third penalty awarded to Sweden in the history of the event. Only France have also been awarded three penalty kicks without ever missing one.